We spent over 18 hours researching and testing 20 different types of travel irons and found that performance, ease of use and cost were most important. The Ivation small travel iron scored high marks in all categories and is our top pick. This travel iron provides 420 watts of power in a tiny package. It is easy to pack on business travels or vacation. The 7 ½ foot long power cord is very convenient, allowing you to iron anywhere you need to without being confined to a small cord. 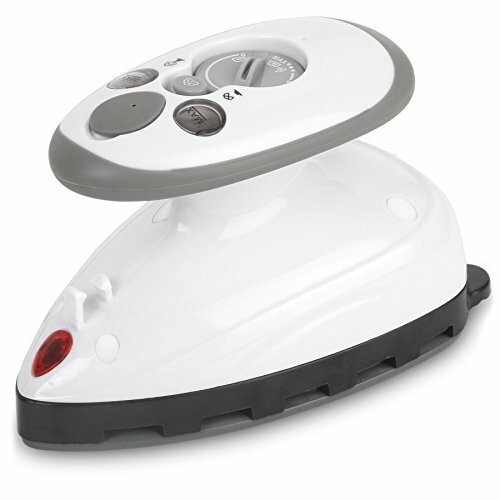 Despite its size, the Ivation travel iron does a great job ironing any clothing you need ironed. Although the iron is an appliance which seems like it’s been around as long as time itself, picking out a new travel iron may take a bit of research, being that the two appliances are, in fact, different technologies. In this review, we’ll not only steer you in the direction of three of the very best travel irons on the market, but illustrate just what it is that makes an iron so good to begin with. 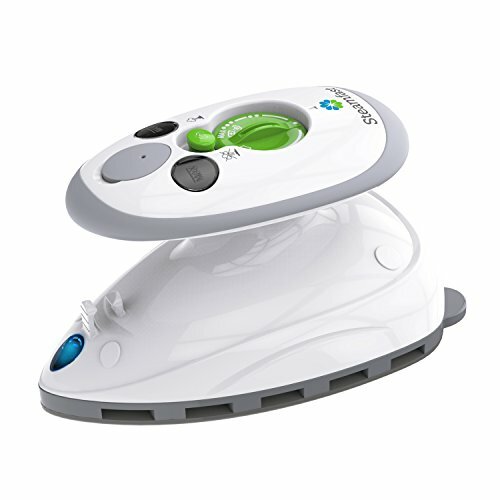 As such, whether or not you decide to buy an iron from the below list, you can be sure you’re getting a great product. Ivation is a brand who has quickly been climbing the ladder in the home appliance market as of late through its release of many of today’s newer and more innovative solutions to age old problems. This particular travel iron is one of such solutions. At 420 watts, you may be surprised at just how powerful this unit truly is, especially when you consider its overall size, which is quite small in stature. A good power-to-size ratio is exactly what you want to see in a travel iron (or a travel anything for that matter) and the Ivation Small Mini Iron delivers in this regard. While it may look similar to nearly every other travel iron on the market, the Ivation Small Mini Iron has a couple of convenient features which prove to distinguish this travel iron from others. For example, you’ll find its power cord – which is seven and a half feet in length – to be rather convenient, allowing you to iron from anywhere in the room. Its quick heat-up time will prove to be rather convenient as well. It also has a safety feature which prevents both bursts of steam and drips of water from coming out of the unit. As anyone who’s used an iron by now knows, this is a huge relief. As such, the Ivation Small Mini Iron isn’t only one of the most effective products of its type, but one of the most convenient as well. The SteamFast SF-717 is nearly identical to the aforementioned Ivation brand in just about every way. That being the case, you can expect an equally quick heat-up time (fifteen seconds), the same amount of power (420 watts) and roughly the same overall size. In fact, you may not even be able to tell the difference between the two upon first looking at them. However, the SteamFast SF-717 proves to be a slightly cheaper version (with slightly less features), making it great if you find the Ivation to be just a tad too expensive. The SteamFast SF-717 does not come with the same safety feature that the Ivation uses to prevent dripping. While this particular unit may not have a tendency of constantly dripping, it’s always nice to have some sort of assurance that this is truly the case. Either way, if you don’t mind giving up such a feature in the first place, the SteamFast SF-717 can give you an otherwise high-quality unit for a more agreeable price. Perhaps the template which the two above brands seem to follow just doesn’t give you what you’re looking for? 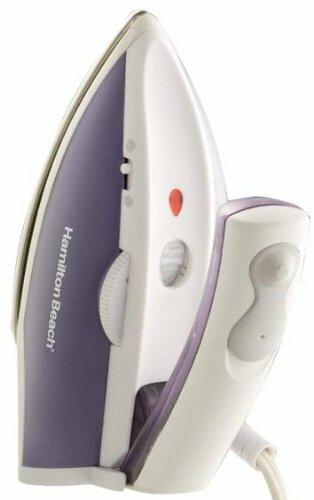 You may want to try the Hamilton Beach Travel Iron on for size. With 800 watts at its disposal, you’ll find it to be nearly twice as powerful as the above two brands. This is great if you plan on tackling a large variety of big jobs which many travel irons just can’t seem to handle in a reasonable amount of time. It also has a continuous steaming feature. While this may cause you to go through water a bit quicker, it allows you the ability to get through even more clothes in an even shorter amount of time. It also has a water capacity of seventy millilitres. Although such a capacity may pale in comparison to many traditional irons, it’s actually quite a bit larger than what you might expect to find in a large portion of travel irons currently on the market. Overall, the Hamilton Beach Travel Iron’s water capacity, continuous steaming and high amount of power give it a more heavy-duty feel without hurting its travel-sized status. This is perfect if you find normal irons to be too big, though find most travel irons to be too lightweight. Each of the above travel irons is great in its own right. At the end of the day, you can reasonably expect any one of the above products to be able to handle any possible job you might happen to throw at it. Picking the right one; however, can make your life a whole lot easier whenever wrinkles come around. For example, if you know you’ll be ironing multiple articles of clothing at any one time, the Hamilton Beach Travel Iron is definitely your best choice due to its large amount of power and very agreeable water capacity. If you’d rather a travel iron with an extreme level of convenience, the Ivation Small Mini Iron might be a better bet. Its very small build, long power cord and its ability to prevent drips will surely give you just what you’re looking for. On the other hand, if you’d still like a convenient product but don’t mind making a couple sacrifices here and there to save a bit of money in the end, the SteamFast SF-717 is definitely the travel iron you’ve been looking for. If you’d like to branch out and do some shopping outside of the above list of travel irons, keeping the following considerations in mind can ensure you walk away with the right product to meet your needs. Just because a product has “travel” in its name does not necessarily mean you will be able to travel with it. Any good travel iron should have its size specifications listed either on its package or somewhere online. If you can’t find out its exact size and can’t see it in person, you may want to consider just how much space you have to carry it around with you, being that it may be a bit larger than you’d like. How much clothes do you need to iron at one time? The answer to this question will dictate just how small you’ll be able to go before the travel iron you’ve set your sights on becomes too small. For quick touch ups on your shirt before you head out for the night, getting a more heavy-duty unit will likely prove to be more expensive and harder on space than need be. Generally speaking, getting a larger unit than you need is counterproductive when we’re talking about irons made specifically for traveling. Will you iron your clothing pre-emptively? If you plan on waiting until the last minute to get your ironing done, you should consider going with a smaller unit. Because larger units take longer to heat up, they may prove frustrating when you’re simply trying to get a wrinkle out of your shirt before heading out the door. On the other hand, if you typically iron your clothing right after it comes out of the laundry so as to prevent emergency situations in the future, you may be able to get away with a larger unit. Will you always be near a wall outlet? If not, your best bet is most likely to opt for a travel iron of the cordless variety. These irons can typically hold a charge long enough for you to iron a few articles of clothing, though are extremely lightweight. While these may be your only option if you don’t always have access to a wall outlet at any given time, they should probably only be used for such situations. Otherwise, travel irons which plug into a wall will have the potential to take on much more clothing at once without cutting out and will often come with a higher degree of power and effectiveness, which are great things to see in an iron for obvious reasons. How many different fabrics will you be working with? If you know you’ll be ironing everything from delicate fabrics to heavy denim items, it might be best to grab an iron with a surge control feature. This feature allows you better control over just how much steam is being released, allowing you to lightly iron delicate fabrics while blasting everything else. Of course, if you don’t have any fabrics which are overly heavy or overly light, such a feature may prove to be nothing more than a money pit. It’s up to you to decide how your clothing responds to different levels of heat. There are a variety of features which you may find in irons which, depending on your personal needs, may either help or hinder your efforts. Take a look at the following features to see whether or not you should buy an iron which includes them in their make. Surge Controls – The only time you’ll find this feature useful is if you work with a large variety of different fabrics. Shut-Off Feature – This has become a pretty common feature across electronics as a whole and not just travel irons. The last thing you need is to leave your iron on, possibly posing a serious danger to you and others. If you’re the type to forget to turn off your electronics, this is a great feature. Otherwise, it may be rather inconvenient, being that it may shut off every time you lay it down for any length of time. Steam Controls – Steam controls are a less dramatic approach to surge controls. However, unless you plan on dealing with very heavy fabrics or very delicate fabrics, such controls will only prove to be a price markup. Whether or not either of the above features could be considered good all comes down to a matter of preference. There are; however, a few features which can only serve to help you without posing much in the way of potential drawbacks. Drip Prevention – Some irons (such as the Ivation we covered above) come with features which prevent the iron from dripping. Not only does this make ironing a less messy business, it may prevent you from burning your hand with hot water. A Long Cord – Many travel irons don’t advertise the length of their cords. However, if you happen across an iron which has a rather long cord, you’ll certainly appreciate the added bit of convenience. A Short Heat-Up Time – Of course, why wait around all day for your iron to heat up if you don’t have to? The shorter the heat-up time, the better. A High Wattage – Now, not everybody needs a high wattage. However, having an iron which is capable of getting the job done in a shorter amount of time can never be seen as a bad thing. The higher the wattage, the more powerful your iron can be. While it may not seem to be the case at first glance, the possible variations between each and every travel iron are huge. Through a wide variety of different features, you’ll find there’s an iron available for every type of user and for every type of situation. Whether you’re ironing jeans in the living room or fixing up a blazer on your way to work, the travel iron most suited toward you is sure to be out there. Through keeping all of the above considerations in mind, finding the perfect travel iron should prove to be a very easy ordeal.